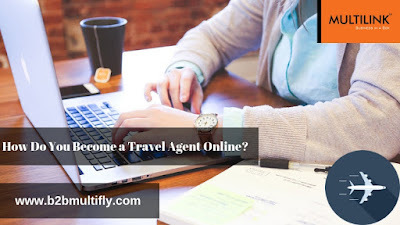 How Do You Become a Travel Agent Online? A Travel Agent provides services related to travel and tourism to the customers with the assistance of various suppliers like -airlines, car rentals, cruise lines, hotels, railways, travel insurance, and package tours. Travel Agent’s task is to make the travel process simple for their customers and also provide travel packages’ and offers for the same. Travel agents earn commissions by booking a car, hotel or flight for clients. Travel Agent can earn commission ranging from 5% to 15% which depends on various factors .The online booking system makes it easy to keep track of the established commission rates and make sure that each and every agent gets the commission. Through Multilink, agents can earn commissions at a high rate. Travel Agents earn profit from the commissions they get from the clients. This commission generally is a very small amount of the revenue received. The airlines too provide a certain amount of commission to market through agent thus providing the agent with a huge amount of business. The tour operators, hotels and cruise operators to pay commissions for bookings. o Travel agents get a complimentary stay or heavy discounts offered by hotels. o Online travel agents are their own boss. o Travel agents can work from home or the place you are comfortable with. o Travel agents can work as per their convenience. o Travel agents get high commissions by doing what they love. You need to fill in an enquiry form at B2B Multifly’s website then the customer care executive will guide you ahead. All you need is a Computer with internet connectivity and then fill out an enquiry form at B2B multifly.com through which our customer care representative will guide you with further proceedings. If you’re looking for an opportunity to be a travel agent, and respected brand with a high commission then, you are at the right place! Enrol with Multilink today! Which travel technology help online travel agents? Modern technology has transformed the world and has brought proficiency, automation, artificial intelligence (AI) and customer intelligence to create more business opportunities. The travel and tourism sector in particular has benefited from the internet and other technological solutions. It is a boon to the travel agencies to make things move faster and with greater accuracy. Most of the holiday packages, travel trips and cruises are booked through travel agencies hence, the impact of technology felt is enormous. Let us read further, which technologies have helped travel agents to enhance customer satisfaction and create potential income. ASP.net, VB.net, AJAX, Java Script, PHP etc. are few tools used for developing portal and implementing end-to-end web solutions for travel planners. By developing the portal, accurate data can be maintained. Portal development enables travel agencies to deliver high performance, user-friendly and affordable internet booking queries that help you to get spontaneous online response and sales. Flight and hotel booking engine is the latest online system that helps the end-users to search and book the most affordable airline. It allows the user to explore destinations world-wide on the airline interface booking system with the prices stated in the user-friendly GUI interface. After receiving entire information of the airline and the destination, the client can select the choicest flight and proceed for making confirmed booking. Several leading travel technology solution companies provide top class technology products to the travel industry. These products assist in B2B selling, Tour Operation, Retail Sales and Business Travel Intermediaries. Such products help the travel agencies to organize their business process, optimize revenue and improve customer assistance. These companies adhere to strong ISO and CMMI standards to ensure quality and hassle-free services. SEO in travel and tourism industry is not just a theoretical concept but contains step-by-step approach to optimize the site for search engine. You can get more leads for your business, create user-friendly website, find prospective customers, explore novel and new markets, accomplish higher conversion rates, build brand image and design your own digital marketing campaign. Funds spent on SEO should be considered as investment and not cost to the company. Application Programming Interface (API), allows the developers to link a variety of software products without revealing the source code. If you are running a hotel or travel agency, you can allow your customers to rent a car directly from your website by linking your room booking with local cab/car rental providers. This facility nullifies time spent on surfing for the best car rental deals and gives a peace of mind to the clients. Clients world-wide are affected by the booming travel technology. Statements like “App for Everything” has become popular for travelers to browse the website, get the best deals and offers and enjoy the finest and most affordable accommodation- all due to one click on the app. This is the power of travel technology.. share if you agree.